Please read the terms and conditions below carefully about our website as well as the apps. These terms and conditions are subject to changes. If you do not agree with the terms and conditions then kindly do not access. ACCESSING THE SITE: The site is intended for users 18 years and older. We reserve the right to amend or close the site at any time. We are not liable if for any reason all or part of the site is unavailable at any time. 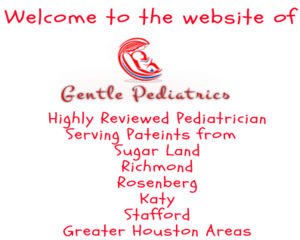 COPYRIGHT & OWNERSHIP: The website is owned and operated by Gentle Pediatrics, PLLC and the contents featured and displayed including, but not limited to the text, graphic, photographs, images, sound, illustrations and software is owned by Gentle Pediatrics, its licensor and/or its content providers. LINKS FROM OUR WEBSITE: Our company is not responsible for the contents or reliability of any external websites that we link to. Links should not be taken as endorsements of any kind. We cannot guarantee these links in any manner. VIRUS PROTECTION: We do make an effort to check the production of our website. However, we cannot accept any responsibility of any loss, disruption or damage to your data or your computer system or any other equipment that may occur while using material of our website.